The first manicure of 2014. Do you find yourself saying this about everything you do this year? The Monday Manicure is back after being away for a while. During December I posted about the Ciaté Advent Calender every single day, showing you which polish I got and my thoughts on that shade. This minty blue shade called Pepperminty was behind door number eleven and back then I swatched it on a nail wheel instead of my own nails. 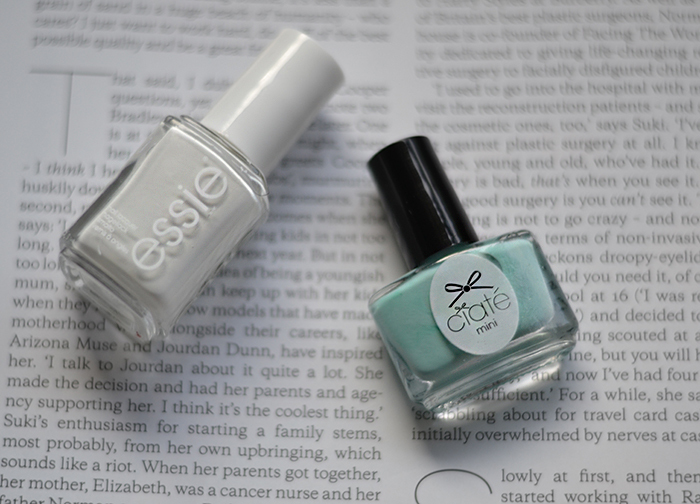 Because this pastel blue shade does not cover in one coat, I first applied a coat of Essie Blanc. I normally would just go with two coats, but because these are miniature size nail varnishes I want to make it last as long as possible. Just a thin, not quite opaque coat, of the white polish will make Pepperminty pop that much better. The result is a creamy soft shade that still pops and looks interesting. Although this is a pastel shade, it's more of a bolder color for me. Especially during this time of the year. I stick to dark shades of red, taupe or navy usually. This shade is a lot lighter than I am used to. But I wanted something cheery to lift up the crappy day I am having. Nothing serious, just had a bad sleep and dealing with a terrible cold. This week will be pretty uneventful, just finishing up on the travel magazine at school and then I have quite a bit of time off to catch up on things from the previous year. I've made plans to meet up with a friend who lives in another city, and I haven't seen here in a while. So I'm really excited to go to her and take some photographs of gorgeous Utrecht.